This curriculum has been updated to include the changes coming to E/M coding with our new module, "E/M Coding Update: 2019 and Beyond." Click to watch a video of how it works. Click HERE to sign up now for instant access. Money Back Guarantee: We strive to provide engaging, clinically relevant E/M coding education. If you purchase a subscription and are not satisfied with our content, simply let us know within one week of signing up and we will refund your registration fee. This is the "core curriculum" of our E/M coding series and teaches you everything you need to know about the key components of history, physical exam and medical decision-making. Using real life clinical examples, you will learn that it's not the quantity of documentation that matters--it's the quality. 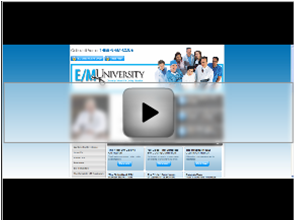 This is program serves as an introduction to the concept of "Rational Physician Coding." Learn how to quantify your medical decision-making to select the "correct" level of care. Then learn how to perform and document the elements of history and/or exam in a purpose-driven manner to maintain compliance. Learn the principles of Rational Physician Coding and how to apply them to the most common inpatient encounters. See how to calculate your medical decision-making first and then use this key component to select the highest ethical level of care every time for every patient. What's the difference between a level 3 and a level 4 office visit? Can you refer to a previous note? When is a comprehensive history not really a comprehensive history and why is this okay? Get the answers to these questions and more during this presentation. How many key components are needed? When is a detailed history not a detailed history and why is this okay? This online learning module uses realistic clinical examples to answer these questions and more. See why many physicians over-document and undercode for these encounters. This presentation takes you step-by-step through all levels of care for these services. Using real-life clinical examples, you'll learn how to document all levels of care for admission H&Ps. The documentation required for observation care services is also discussed. Always select the "correct" level of care to avoid under-coding while maintaining compliance. See what it takes to qualify for critical care and learn how to calculate the time spent. See which procedures may be billed separately and which are bundled into the critical care codes. This program also deals with coding for time-based E/M visits, prolonged services and discharge services. When is an "old" patient really a "new" patient? How many key components are needed? Can my staff help me out with the documentation? Get the answers to these questions and more during this presentation. Learn to avoid over-documentation while selecting the "correct" level of care for these encounters. Learn how to quantify your medical decision-making and select the "correct" level of care for E/M services provided in the emergency department. Then see exactly what's needed to ensure compliance and streamline the documentation process. This program takes you step-by-step through all levels of care for ER E/M services. The rules for documenting and coding for critical care services in the ER are also discussed. LMS Hosting Solutions by Brightcore Consulting. Copyright 2019 Brightcore Consulting.